Hello, hello friends! 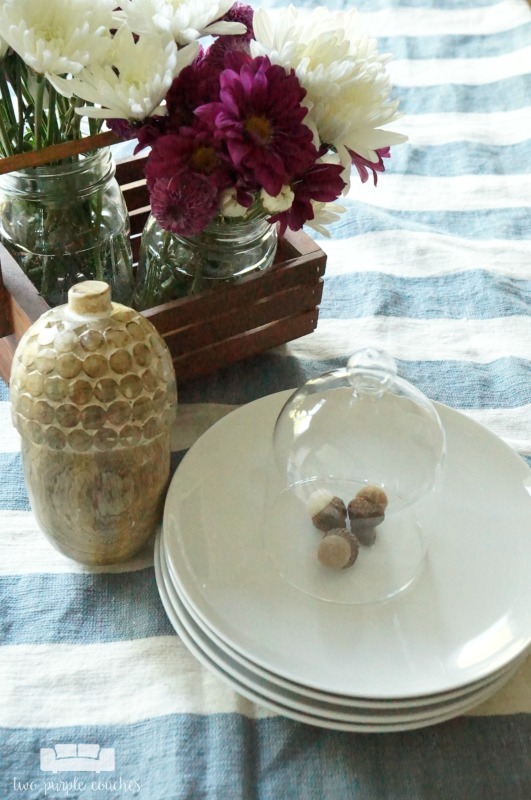 I hope you’re in the mood for fall because I’ve got a fall home tour to share with you today! Well, actually, there are lots of fall home tours you can check out today and every day this week! 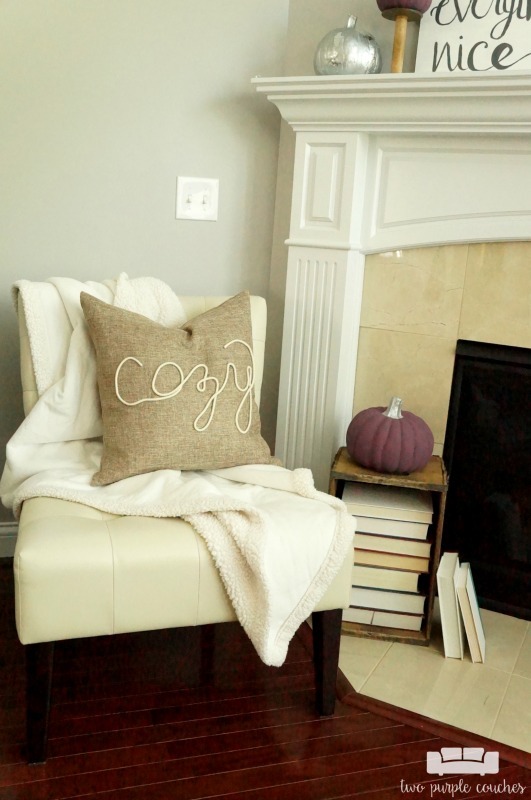 My friend Meg from Green with Decor invited me to share my fall home tour along with 33 other bloggers this week. I’ve already visited some from earlier this week and let me tell you—they are good! 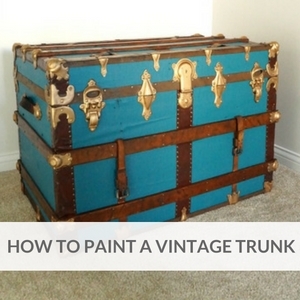 So many beautiful home decorating ideas for fall, and some non-traditional uses of color, too! 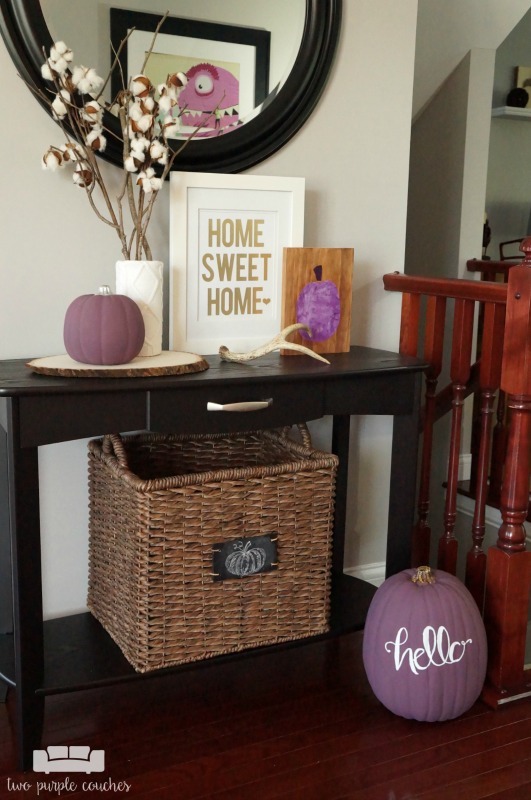 Which is a great segue into my fall home tour, which of course, features plenty of purple! Last year I included a little bit of purple into my fall decor, but this year, I went whole-hog! 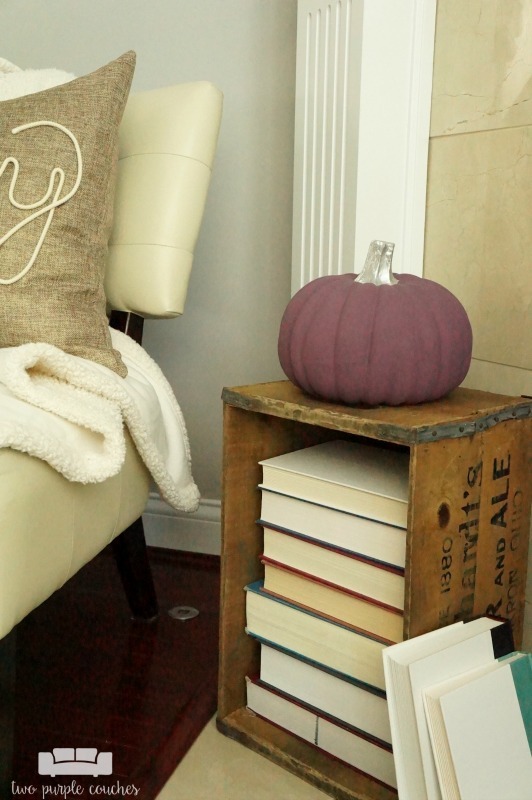 Lots of purple pumpkins, books and book pages, wood grain, silvery mercury glass, and texture. 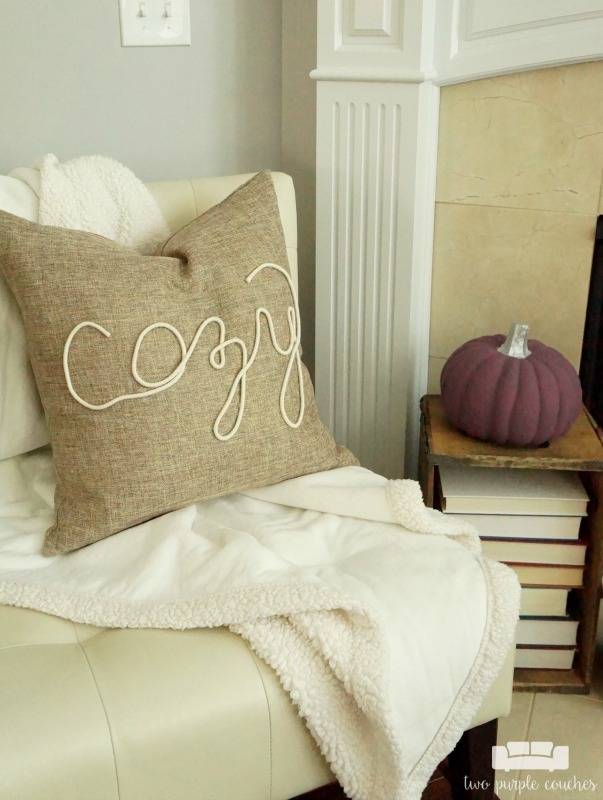 I added the word “cozy” to a store-bought pillow using cotton cord from the craft store. 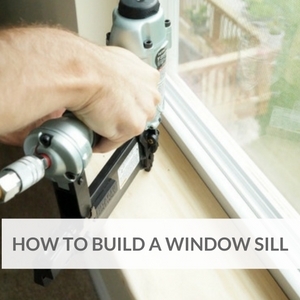 You can read the full tutorial here. 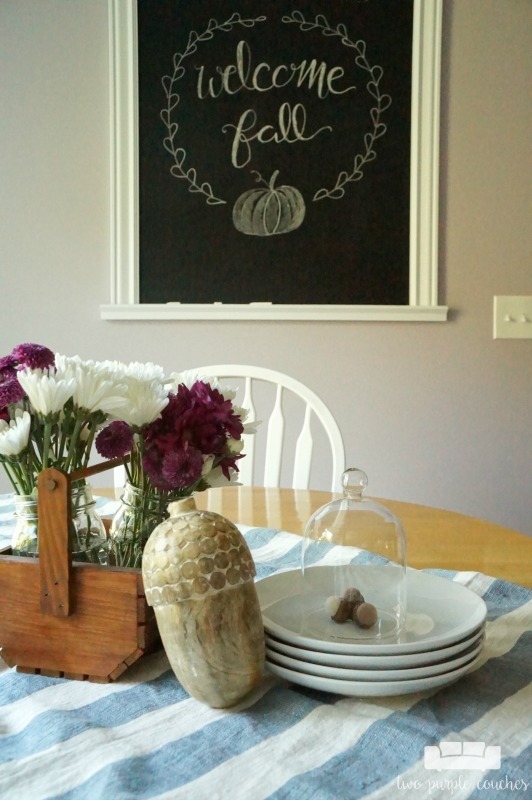 I finally changed up our kitchen chalkboard for fall (it’s been blank for—ahem—months). 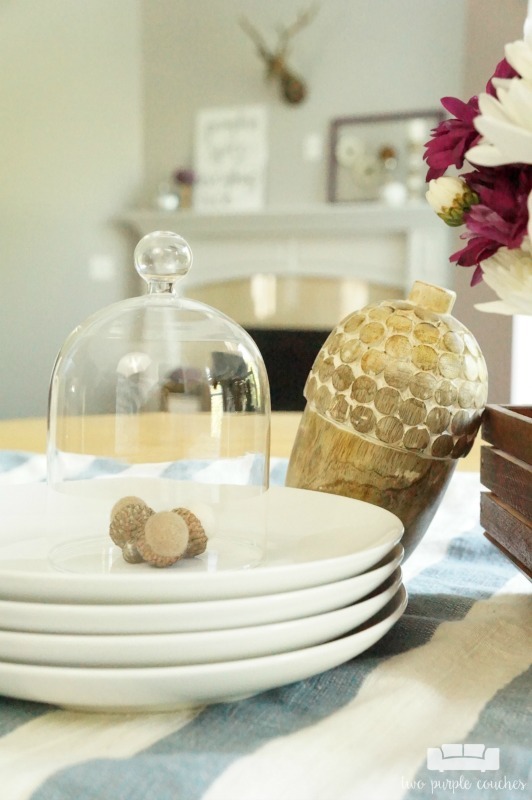 I bought the mini cloche at the Country Living Fair last weekend—isn’t it the cutest!? 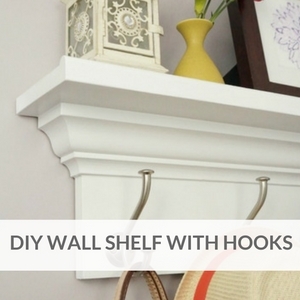 I still adore this simple wall shelf that we built and hung near the door to our garage. 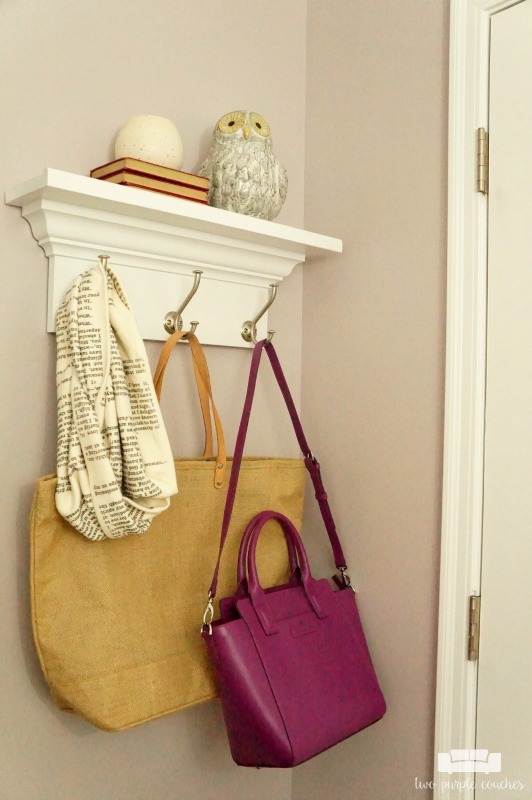 it’s the perfect spot for holding our coats, scarves, umbrellas and bags. 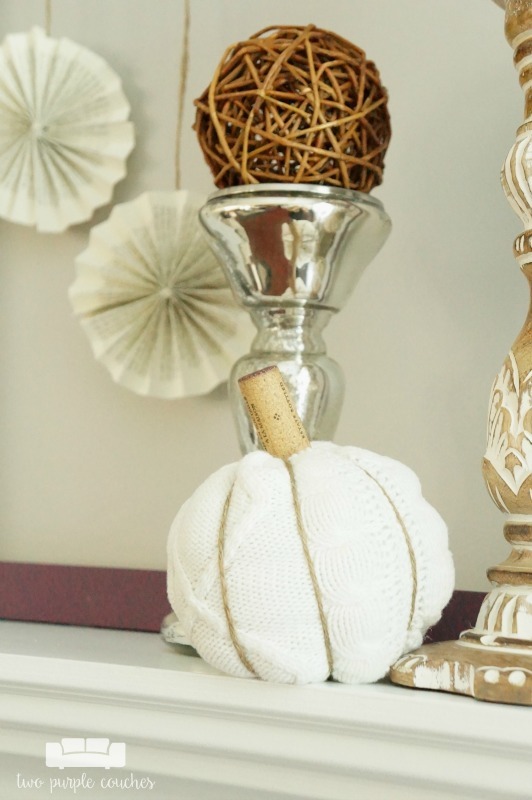 And the shelf means there’s another spot for me to decorate each season (wink). I hope you enjoyed my tour! There’s plenty more home decorating inspiration to be seen – check out the full line-up of this week’s tours below! While you’re here, don’t forget to enter my giveaway for a $75-off-code for JORD Wood Watches! 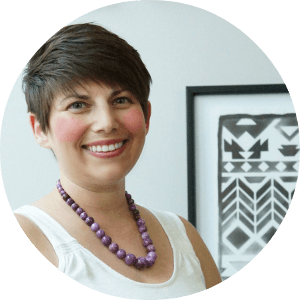 This entry was posted in Around the House on September 22, 2016 by Two Purple Couches. 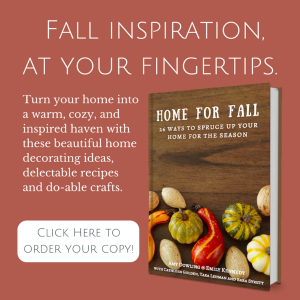 Emily – your fall Home tour is fabulous. 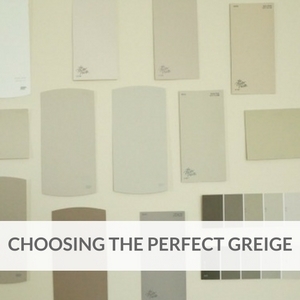 We see that you share our love of purple! 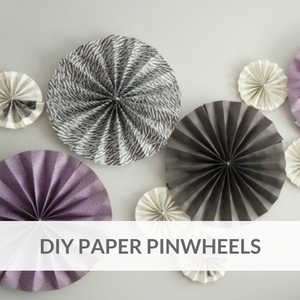 All of your DIY projects and personal touches are super creative and look wonderful in your home. Emily, your home really looks beautiful-I love the fall touches. Pinning! You got me with the purple pumpkins!!! 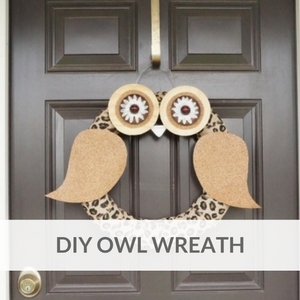 So cute and I love all your dining room touches with the acorns etc. The pillow COZY is adorable. It looks beautiful, Emily! I love all of the purple!! I am loving all your purple touches! Your home is beautiful and ready for my favorite season! Thank you for bringing us in! Love this, Emily! 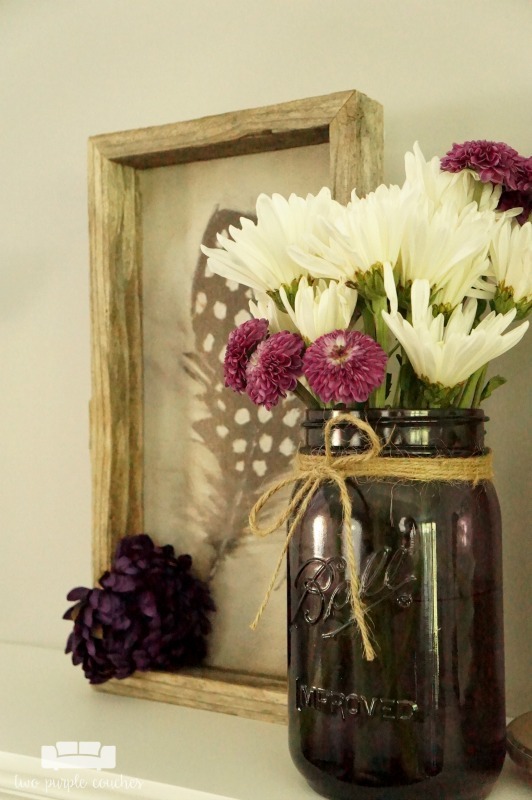 All of your purple is PERFECT for a different twist on fall decor. It’s gorgeous! 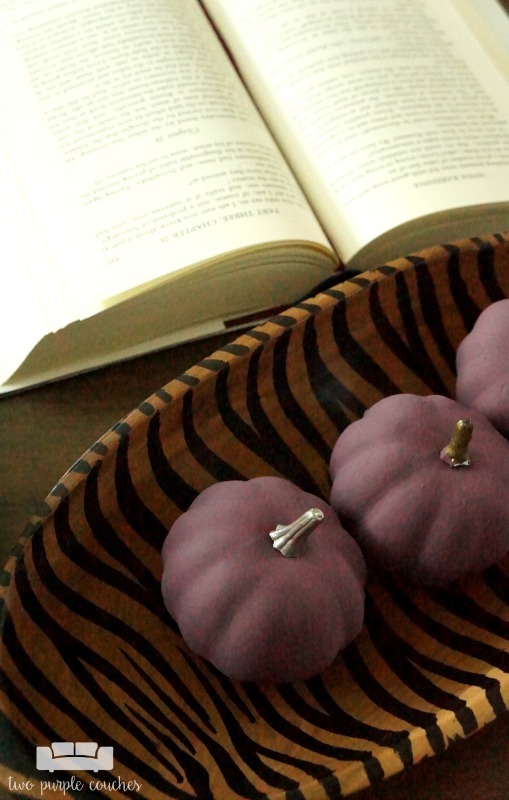 Oh my goodness, the purple pumpkins are the best! 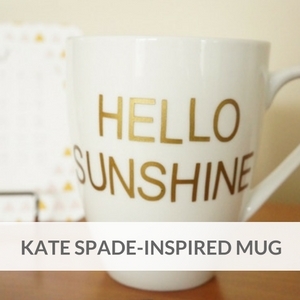 Love them – such a unique and personal touch. I also love how you drew a pumpkin with chalk on your basket. It’s the little things that bring it all together. I must admit, purple is not the first color that comes to mind when I think of fall. But, you incorporated it so beautifully and I am totally digging it! Keep on doing your thing, because you do it so well . Thank you so much, Erica! I’ve always wanted to go all-out with purple in the fall and I’m so glad I did it this year! 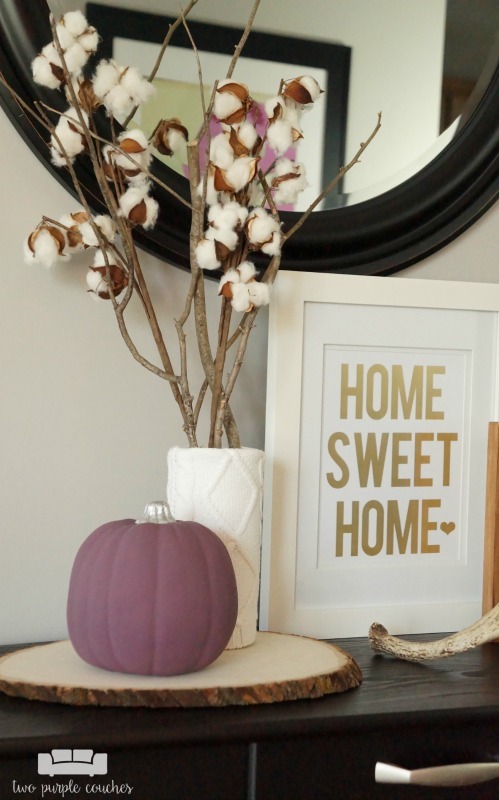 The purple pumpkins are so perfect for your house! Love your chalkboard, too! Emily, I am so in love with your purple pumpkins! Everything looks so pretty! Pinned at least four things! 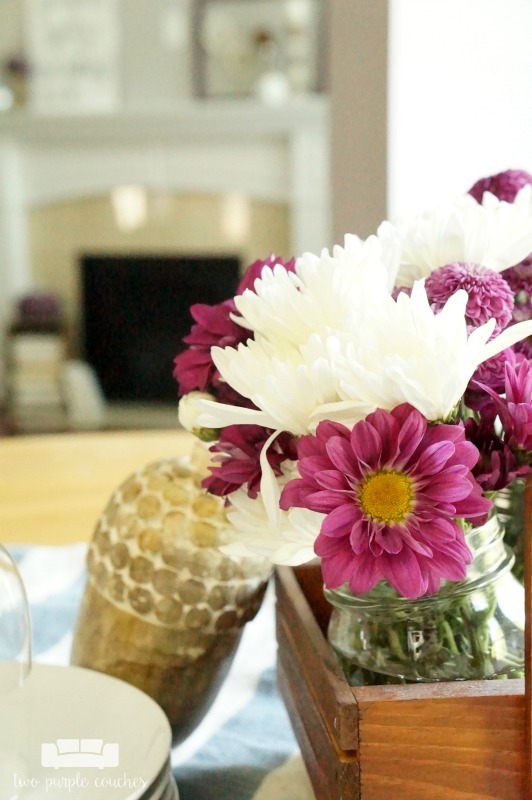 I love the splashes and shades of purple.. so pretty and just a little bit non-traditional. Perfectly you! Go you throwing in that purple for fall. 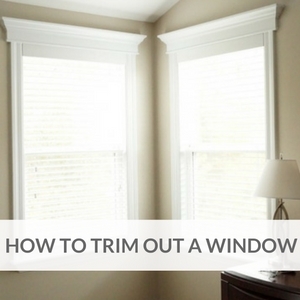 It’s all so beautiful and you totally pulled it off! Thanks for sharing! I love all of the purple fall touches you’ve added! That “hello” pumpkin is adorable! Thanks for sharing your tour with us! 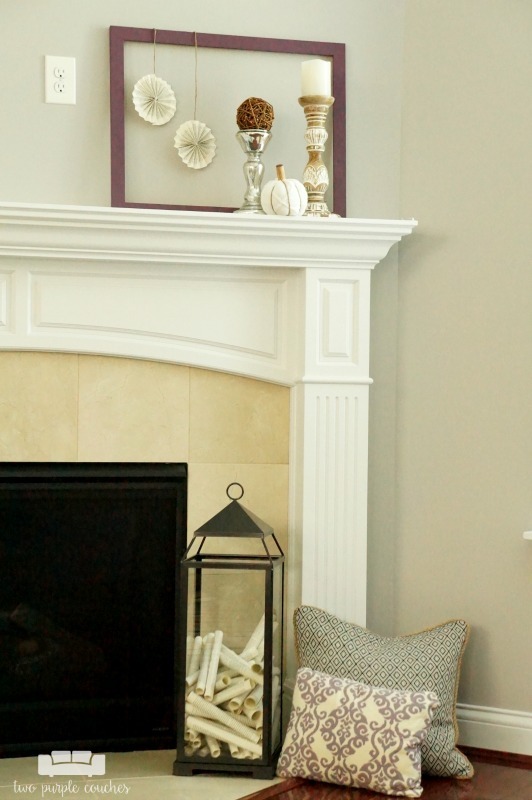 Purple is such a fun color to decorate with for fall! 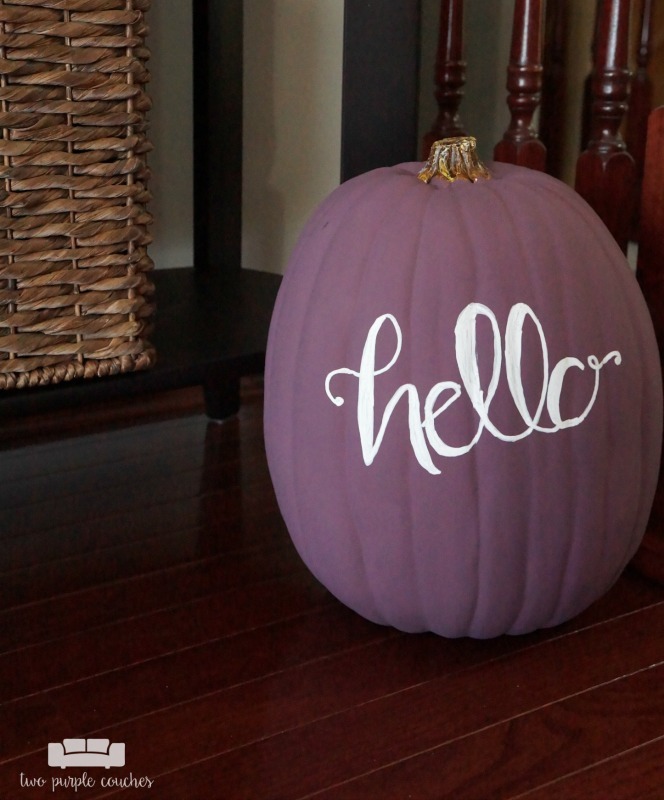 Love that purple hello pumpkin!!! 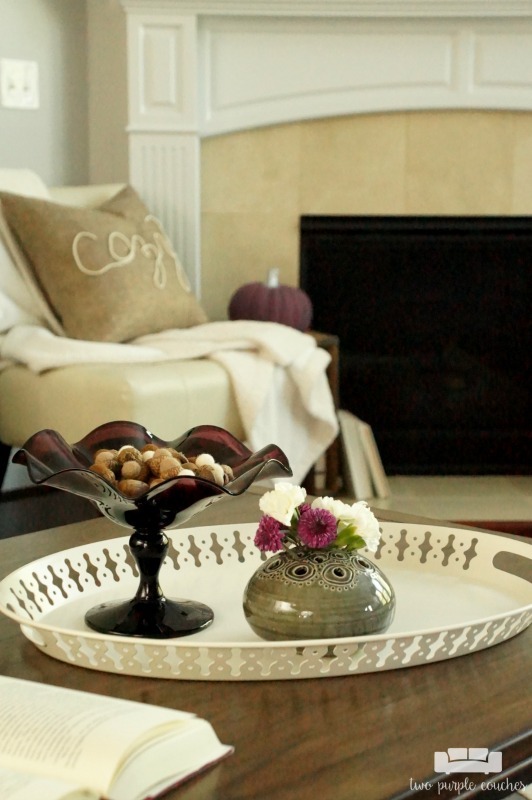 Love seeing your signature color in your Fall decor and the acorn on your table is so cool! I love this!! The mix of purple is awesome and just the right pop of color and so unique! Emily pretty tour!!! 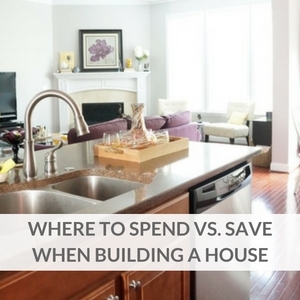 i love the purple touches and your home is so cozy and welcoming. Thanks for letting us in! 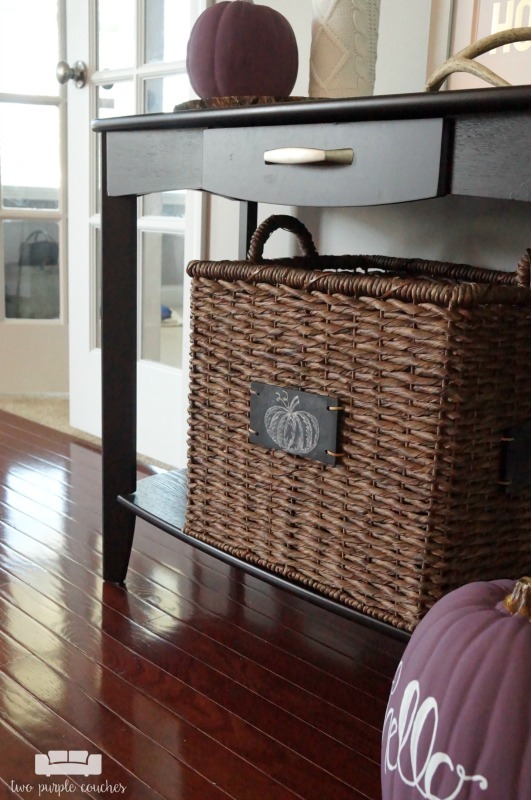 Beautiful fall home tour Emily! I love it all! 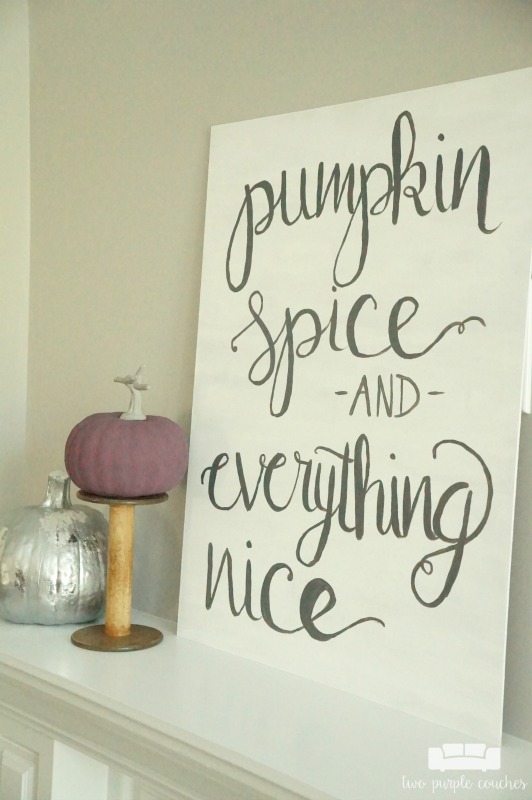 I loved the DIY fall wood block pumpkin. 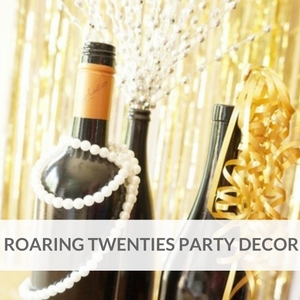 Keep sharing such nice decorating ideas.